Our feature picture shows the setup fielded at Mt Lambie for the 2019 Summer event by Steve VK2KFJ and yours truly VK2ZRH. The final results for the 2019 Summer VHF-UHF Field Day event is posted below. 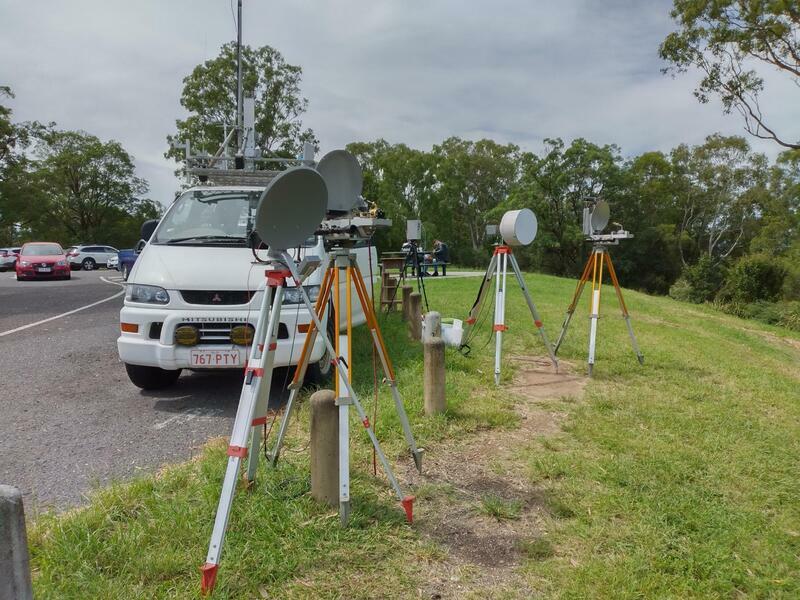 The VHF-UHF Field Days provide VHF-UHF operators with the opportunity to "head for the hills" and see how far and how many they can work. 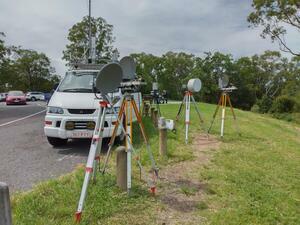 Results of all VHF-UHF Field Days are available in the "Files for Download" section. The first VHF-UHF Field Day was run as a trial in January 1989. It was quite well received so it has continued since then. In 1998, there was a trial Spring Field Day which also proved a success. 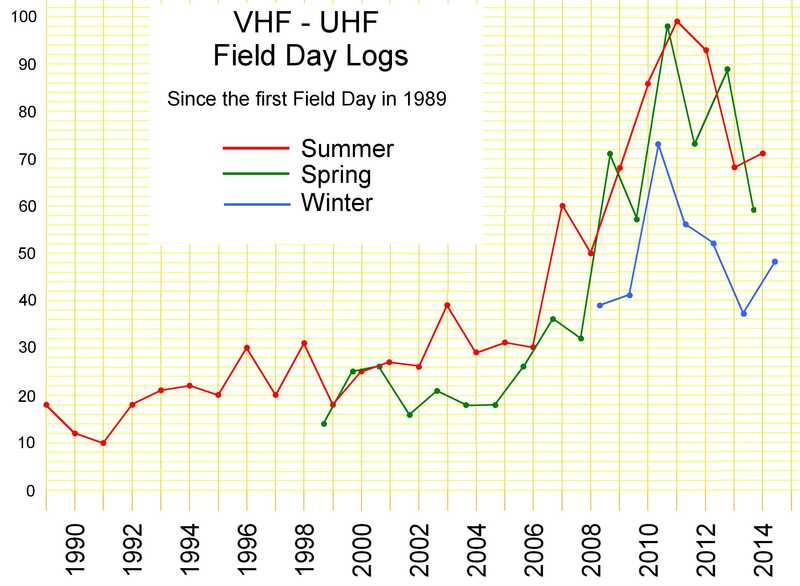 Support for the Field Days continued to increase, and a third event - the Winter VHF-UHF Field Day - was introduced in 2008. In 2014, the WIA board decided that the contest should be run with two parallel sets of rules and scoring systems. John Martin VK3KM departed as Contest Manager after the Winter 2014 event. Winter 2019 - Saturday 22 and Sunday 23 June. Full details of the contest rules are available in the "Files for Download" section below. Full details of the scoring system, and scoring sheets, are available in the "Files for Download" section. Each four-digit Maidenhead locator (Square) identifies an area which covers one degree of latitude and two degrees of longitude. Detailed explanation of the Maidenhead locator system can be found in the Download section below. Also available is a computer program that can convert latitude and longitude into grid locators, and vice versa. An easy way to find your latitude and longitude from a Google map is to click this Link to the iTouch Map web site. To find the six digit Maidenhead locator for any location, click this Link to the F6FVY web site. Logs should be accompanied by a cover sheet including a scoring table as described in the rules. A sample scoring sheet is available for download at the bottom of this page. The aim is to have results finalised approximately four weeks after the Field Day, with the results posted here, publicised via the usual WIA channels and then published subsequently in Amateur Radio magazine. Each top-scoring station in every Section–Sub-section will receive a colour certificate in .PDF format, sent to the contact email address on their log cover sheet. Top-scoring Foundation stations will also receive a colour certificate. Any logging software can be used so long as the necessary information is included in the log. Please refer to the rules for details about this. A suitable logging program is VK Contest Log, developed by Mike VK3AVV. It is available for download on the author's web site by clicking on this Link. The VHF-UHF Field Days are sponsored by the WIA.